The purpose of The Catholic Leader newspaper is to inform from a Catholic perspective and to connect the Catholic community. It is by virtue of these pursuits that the paper nourishes people’s faith and spirituality. Being an ethical and credible source for faith-based news, reviews, and reflection is of integral to the publications’ function as it serves the faithful. And it’s been achieving this vision since it began over 100 years ago. A number of attempts were made to establish a Catholic newspaper in Brisbane during the mid-19th century resulting in a publication called The Age, the first issue of which appeared on October 1, 1892. While The Age continued its weekly publication for many years, a rival came upon the scene in 1910. This was the Catholic Advocate which eventually grew into the ‘No. 1 Catholic journal’ with a state-wide circulation. Owned by Hibernian Newspapers Ltd, it reflected the Irish Nationalist sentiments and was even published in a green cover. It was difficult financial times which brought about the demise of both The Age in 1929 and the Catholic Advocate in 1930. Archbishop Duhig salvaged the former paper and The Catholic Leader rose from the ashes of The Age, the first issue being dated December 5, 1929. At this stage, the price was threepence. The paper was then the official organ of the Archdiocese of Brisbane, circulating throughout Australasia and having correspondents in Rome, Paris, London, Dublin and the United States of America. The Catholic Leader continues to be published by the Brisbane Archdiocese, circulating weekly throughout Australia, at a cost of $2. With an eye to the future and knowing the importance of staying relevant in a changing world, The Leader meets the challenges of keeping readers informed and aware of what is happening in their Church and their world, earning the reputation as Australia’s leading Catholic Newspaper. This looking to the future has resulted in catholicleader.com.au, an online extension of The Catholic Leader. This site contains the content in our newspaper edition plus much more. Matt was appointed editor of The Catholic Leader in July 2013. He’s been working in the newspaper industry for 20 years. He’s held senior editorial positions in regional Queensland newspapers. He has undergraduate degrees in journalism and history and a Masters in Journalism. He’s undertaking postgraduate studies in theology, philosophy and communication. I am married with three adult children and work as a sub-editor for The Catholic Leader. Having worked in the media industry for more than 30 years, from the “primitive” days before computers were part of our daily lives, being with the Leader for its launch into the use of digital mediums such as Facebook, Twitter and Pinterest is a new adventure. In my first days as a cadet journalist with a country newspaper, in northern NSW, I would write stories using a typewriter and small sheets of copy paper to hand to the editor, and it would take a day or two for the news to reach our readers in print. Now, at the touch of a button it’s possible for someone to be reading our snippets of news on the other side of the world within seconds – and we’re already taking that for granted! I look forward to being part of this new chapter for The Catholic Leader, and utilising a new medium for Good News. I am one of three Canadian-born daughters to two Mauritian-Chinese parents. I speak a mixture of French, Mauritian Creole, and English, and sometimes, gibberish. Between 2007 and 2009 I volunteered with Australian Catholic organisation Youth Mission Team, living in Sydney and Perth. I have a degree in Media and Communications from the University of Sydney and over five years’ experience in radio announcing and audio production, community television presenting and was the co-host of a weekly relationships podcast for Australia’s first online Catholic radio station, Cradio. I have won several awards for my work at The Catholic Leader, including the Australasian Catholic Press Association’s 2015 Best News Story for my coverage of Orange Sky Laundry. I believe all Catholics have a story to tell and I have the means to tell it. My previous work as a Cross-Platform Communications Strategist for IMC Agency (Integrated Marketing and Communications) Virtual Shout gave me an understanding of the necessity of good publicity for the Church. Debbie Preuss came to us from Allora in 1978 as a shy country girl. Only employed for three weeks initially, after 35 years, she still remains with us. Over time she has worked from hand written receipts and manually produced wrappers to computerised work. 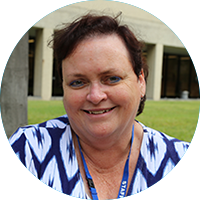 Debbie is the friendly voice you hear on the phone when you ring regarding subscriptions and delivery problems with the Leader. Debbie is married to Frank lives in Brisbane and lists reading, fishing and cooking as her hobbies. Mark is the joint winner of the Australian Variety Club 2000 Heart Award for his radio news reporting in East Timor, and has also won a Walkley award, Australia’s most-respected journalism award. Mark is the author of ‘Running Amok’ that chronicles his time as a correspondent juggling news deadlines and the demands of being a husband and father. Mark is married with four children.